Muslims have long played a central role in American history. Since the colonial period, when an estimated 20,000 African Muslims were transported to America as slaves, to the early 20th century, when Muslim immigrants came to the United States from the Middle East, Europe, and Asia, to the present day, Islam has been an integral part of the American experience. The terrorist attacks of 9/11 produced a heavy backlash against Muslim Americans, contributing to their being stereotyped, maligned, and marginalized in American society. Encyclopedia of Muslim-American History places Muslim Americans squarely in the center of American history and culture. Written in clear and jargon-free prose, this authoritative reference provides a new and broader, more inclusive approach to American history. Including nearly 300 articles, this two-volume reference set is the first to focus on this critical subject, covering all the historical and contemporary issues, events, people, court cases, themes, and activism relating to Muslim Americans. More than 100 historians, scholars, and experts contributed to this encyclopedia, tracing the experiences and impact that Muslim Americans have had on our nation's history for hundreds of years. Helpful reference features include original documents, a master chronology, and an extensive bibliography. Black-and-white photographs and illustrations. Index. Appendix. Bibliography. Cross-references. Chronology. Original documents. In two volumes. Edward E. Curtis IV, D.Litt. et Phil., is Millennium Chair of the Liberal Arts and Professor of Religious Studies at Indiana University–Purdue University Indianapolis. He is the editor of The Columbia Sourcebook of Muslims in the United States and author of Muslims in America: A Short History; Black Muslim Religion in the Nation of Islam, 1960–1975; and Islam in Black America. His scholarship has appeared in American Quarterly, Journal of the American Academy of Religion, Religion and American Culture, and Religion. A former Fellow at the National Humanities Center, Curtis has also been awarded Carnegie, Fulbright, and Mellon Fellowships. 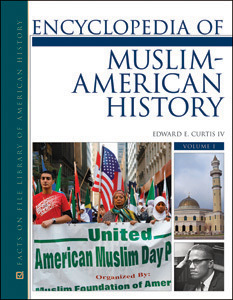 "Filled with high quality, relevant information on a subject of profound importance, Encyclopedia of Muslim-American History is a worthwhile addition to any high-school, public library, or college library collection." "...an impressive overview of the history of Muslim Americans...the most comprehensive of its kind...Recommended." "A necessary and timely resource...Unique in its focus...recommended for all secondary school, public, and academic libraries." "...a welcomed addition to the field..."
"...a great resource for high school, university, and public libraries. It is unique in that there is no other source that chronicles the history of the Muslim-American experience so broadly...recommend[ed]...a great overview...a terrific starting point in discovery of Muslims in America." "Top 40 Reference Titles - 2010"